Here’s the thing with smartwatches. They are absolutely amazing in many ways. They offer an interesting new angle on many of the things we’ve already been doing with smartphones, only they do all of this while being a quarter of the size and sitting placidly on our wrists. The only downside? They are a quarter of the size of smartphones and sit placidly on our wrists. In other words, the screen real estate isn’t exactly Beverly Hills level. It’s more like tiny closet in Manhattan level. Some things are hard to do on the screen of a smartwatch, messaging being one of them. It’s not easy to type on one when you have human-sized fingers. However, app-makers have been handily tackling this problem and now the Samsung Gear 2 line of smartwatches gets its very own solution. 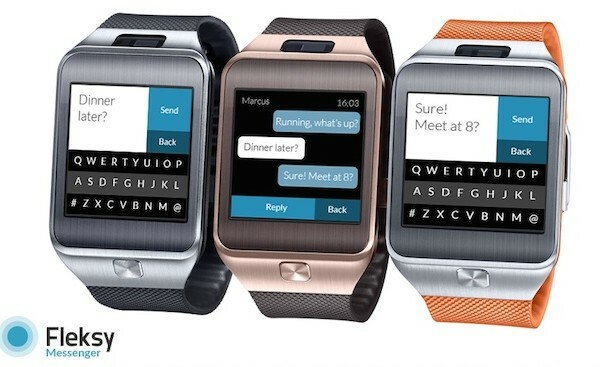 Fleksy, who are in the business of making predictive text applications for smartwatches, have begun to ply their wares on Samsung’s line of watches. This has taken longer than anticipated due to Samsung’s recent shift to their own operating system, called Tizen. The app imports all of your contacts and all of your messages and analyzes the way you type to come up with a fairly accurate model of what you’ll want to type just when you input the first letter. It’s pretty neat stuff and loads better than what is typically found in modern smartphones and the like. Fleksy as an app is available right now and it is absolutely free. All you have to do is sign a contract stating that Fleksy will receive sole ownership of your first born child. Wait. That doesn’t sound right. Never mind. There is no such contract.